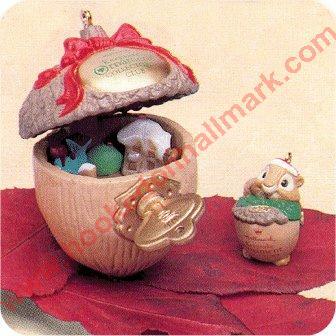 Home > Hallmark Ornaments By Year > 1991 Hallmark Ornaments > 1991 Hidden Treasure - with Mini ornament inside! 1991 Hidden Treasure - with Mini ornament inside! Set of 2-Turn the key to unlock the acorn to find the hidden surprises inside, including a mini squirrel ornament. Our original ornament lost the key and after some searching on the internet we found the replacement ornament. After ordering it, it arrived promptly and in show case condition.